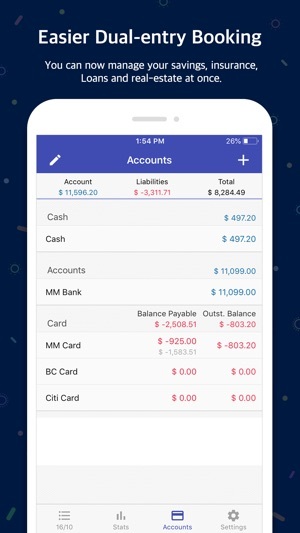 “Money Manager” is an optimized application for personal account management. Household account management is complicated. But we make it simple by simplifying the things that are complex. The default settings will get you started, and once you get used to it, you can alter the settings according to your needs with the highly flexible and customizable functions available. - Super easy and simple to enter data anytime, anywhere. 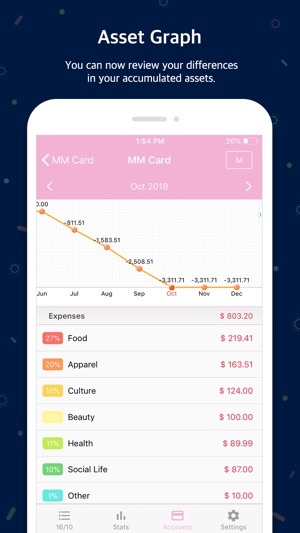 - View your spending tendencies graphically. - View statistics by simply entering the data. - Search and calculator functions. - Set up sub-categories and main categories as necessary. - Manage all your accounts at once. - Check weekly, monthly, and annual statistics. - Use the calendar view. - Use budget planning features to plan weekly, monthly, and annual budgets. - Change the start date of the month. It facilitates efficient account management. Automatically double entry bookkeeping. You can view ‘“Money Manager” application using Wi-Fi or 3G. You can edit and sort the data by date, category or account group on the screen of your PC. In addition, you can see fluctuations of your accounts indicated on graphs on your PC. You can manage your budget. 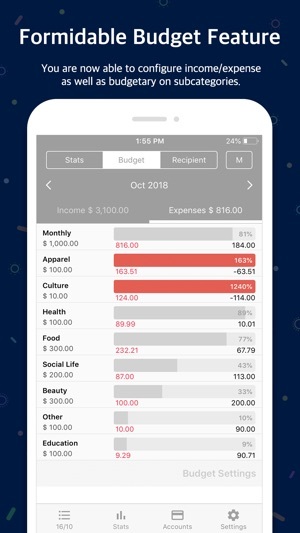 It shows your budget and expenditures on a graph so you can compare the amount of your expenditures against your budget quickly. When entering a future payment date, you can see the payment amount and outstanding balance on the accounts page. 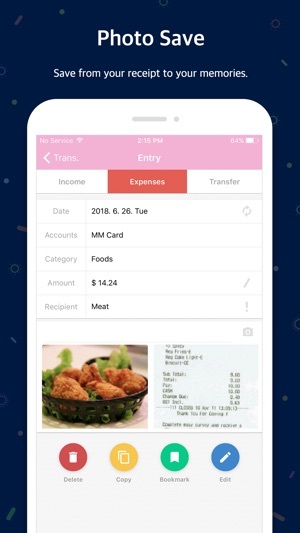 You can connect your debit card to your accounts so that expenses are automatically recorded under a specific account. You can specify the desired time lapse before the app requests a passcode. You can set up automatic money transfers between your accounts and configure the frequency of those transfers. You can sort your expenses by the recipient and view this information graphically. You can easily enter frequent expenditures by creating payment profiles. You can backup and restore your data via email, iTunes and iCloud. Appointed as KT Econovation Architect 2nd Fair Member.ired currency. 3. Recurring transactions should be visible all the time than waiting for beginning of the month. 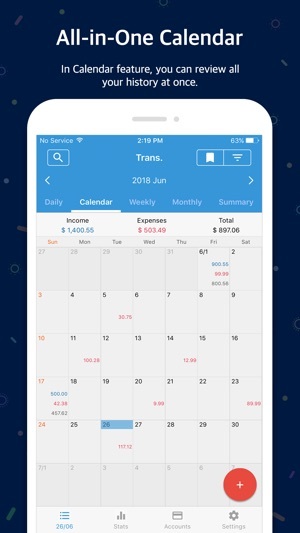 The best money management app period. 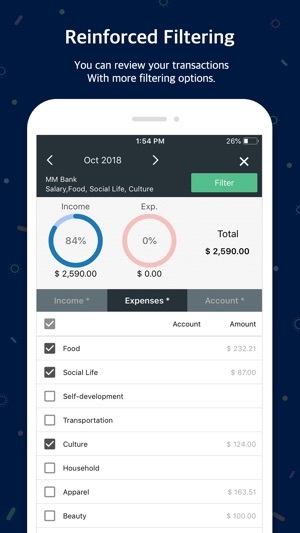 Having tried multiple money management apps across mobile operating systems, I can vouch for the fact that this is the best money management app there is. A star for the fact that the app is still slightly unstable when transferring data between operating systems. The developers are very accessible though. Wish i could add a half star for that. This is the best app I have used so far. You can manage multiple accounts, budgets, EMIs, loans, pwriodical expenses. 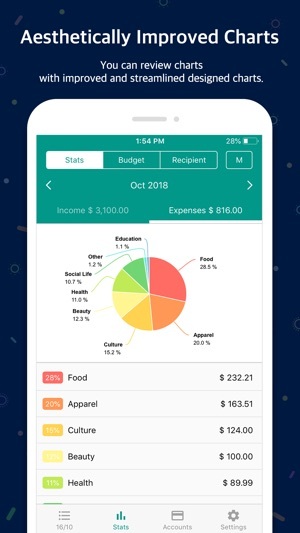 It also gives a broad view of your income and expenses through its stats tab. I got the paid version because it's so much worth it. 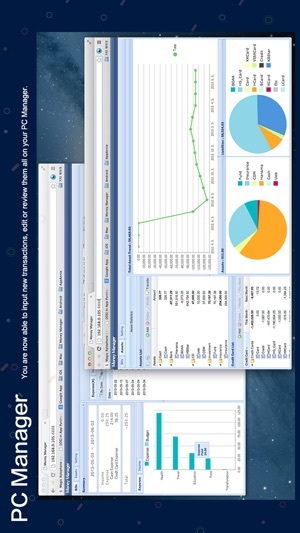 A dashboard can be utilised through PC as well. Highly recommended.